Bangalore University (BU) is a public state university which was established in 1886 and accredited in 1964and is located in Bangalore, Karnataka. It was formed with a vision to promote excellence for a vibrant and inclusive society through the creation of knowledge. The university is structured into Arts, Science, Commerce and Management, Education, Law and Engineering faculties. It offers 50 postgraduate courses, employment and diploma courses and has 30000 students enrolled. Considered Karnataka’s best Multidisciplinary University, it was ranked 245 in the world by BRICS- 2018. The Distance learning program was established in the year 1976 with the goal to improve the access of students to quality higher education. It offers courses in various disciplines across UG, PG and diploma programs. Distance MBA by Bangalore University is one of the most popular courses offered. The courses offered by the University are affiliated to UGC, ACU, NAAC and AIU. All citizens of India residing in India are eligible for the courses offered by the Directorate of Distance Learning program at the university. The application process is offline. A fee of Rs. 550/- needs to be paid at notified branches of SBM/ Directorate of the correspondence course and Distance Education Office. The filled application form along with copies of necessary documents needs to be submitted to the office of the Directorate before the given deadline. Fee once paid for a course is non-refundable neither can be adjusted for any other course. Click on e-payment link available and first fill in your details then proceed with the payment. The form needs to be downloaded from university official site. It should be filled with the necessary details which should be drawn in favour of Finance Officer, Bangalore University, Bengaluru-560056, payable at State Bank of Mysore. Candidates are advised to write their name, address, phone number and course on the back-side of the DD. NOTE- One set of photocopies of the documents should be submitted with the University. Admissions are provisional and get confirmed only after all authentic documents are produced. Students already registered for courses in this university or any other are not eligible for the courses offered under this program. However, relaxation in this matter is subject to the approval of the university. Application need not be addressed to the Directorate for consideration. Migration certificate should be submitted within two months of being enrolled in the course if not available at the time of registration. NOTE: Further detailed guidelines for the documents to be submitted at the time of application and course registration can be referred from the online prospectus. Courses offered: B.A, B.com, B.B.A, M.A (all subjects except Sanskrit and French), M.Com, M.Sc. (Mathematics), Diploma, PG Diploma, PG. Diploma and Certificate Courses. Eligibility: The courses under this scheme require the students to possess prescribed minimum educational qualifications. The students are provided with printed study material for the enrolled course. Eligibility: Interested candidates need to have prescribed minimum qualification and have completed 18 years of age as of Oct, 1st 2014. Along with printed material, classes are conducted, the timetable for which is intimated via SMS. Eligibility: The courses under this scheme require the students to possess prescribed minimum educational qualifications. No study material is provided for these courses. Electives are also available in each course of study. Note: The prescribed eligibility for the respective courses can be referred from the official online prospectus. Permanent graduate teachers of recognized Schools/ Educational Institutions teaching related subjects for not less than 3 years. 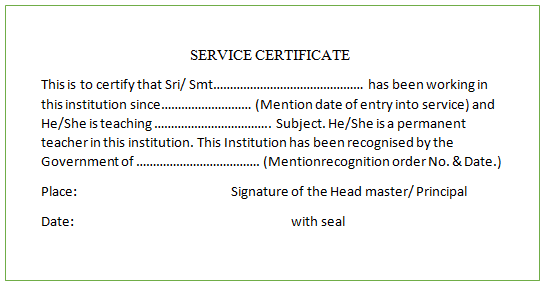 Service Certificate needs to be produced. Candidates who passed their qualifying exams held during 2004 or earlier. Candidates who passed their qualifying exams held during 2010 or earlier will be relaxed by 5% in the minimum qualifying percentage for the interested course. SC/ St/Cat- 1 graduates covered under Karnataka Social Welfare Department to be relaxed by 5%. Blind students are eligible for a relaxation of minimum 5%. Note: The candidates are permitted for only one of the above relaxations in case of overlap. The relaxation application needs to be submitted with the certificate in the following format issued by the Head Master/ Principal, on official stationery of the respective recognised schools/ Education institutions. 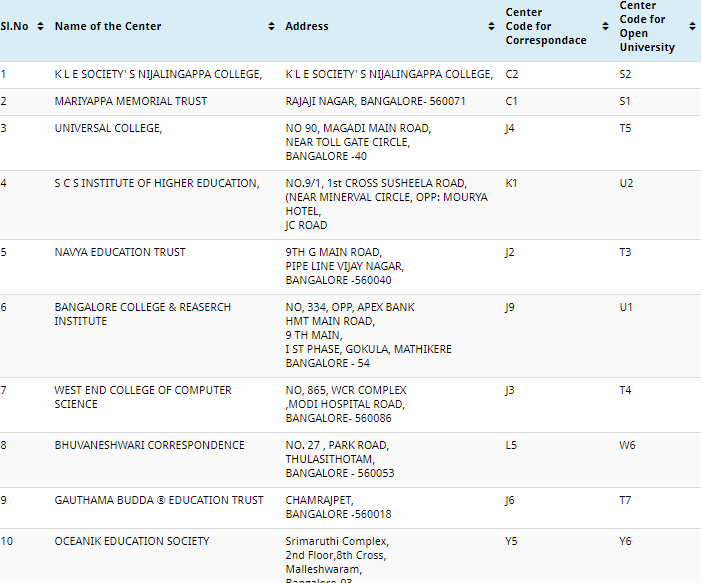 The university has 39 study centres in the various districts of Bangalore. The study centres are given a code of correspondence and a Centre Code for the Open University. Students registered inn this directorate can avail the library services after contact the university librarian for application details. The study material equips the students to excel in the examinations. Students are also advised to refer to additional text books and relevant literature. NOTE: Study material once given will not be exchanged. Contact classes are held for selected courses for better understanding of the material. ID card is annually issued to the enrolled students to be carried during their visits to the Directorate. In case of loss of ID card a duplicate needs to be obtained from the Directorate after submitting receipt for a sum of Rs. 100/-. Enrolled students are sent due messages about the contact classes, important dates, exam schedules, exam fees, admission tickets regularly through newspaper, post, SMS and website. Any changes in the address of correspondence or contact no should be informed to the Directorate for easy access to the notifications. The fees for Correspondence scheme courses varies from Rs. 5,000 to 11,000. For specialized P.G Diploma courses it roughly around Rs. 8, 5000. The fees for OpenUniversity scheme courses is around Rs, 5,500. This is the annual fees including the fee for registration, study material, contact classes, examination, marks sheet which is to be paid in one installment to the directorate. Students who passed qualifying exams from other university have to pay an additional amount of Rs. 1760/- in addition of the course fee. The eligible students can avail reimbursement of fee from Social Welfare Department, Govt. of Karnataka on submitting the application for the same along with the required documents mentioned in section 10.21 of the prospectus. The placement session runs through the course of the year commencing from the last week of July through to March. Pre- placement talks are also conducted for better understanding of the market. Students are provided with placement assistance upon the completion of their programs. The average salary offered for regular courses is 5 lakhs per annum and the highest package was 16 lakhs per annum. Top campus placement companies include- Cognizant, Dell, Maruti Suzuki, Wipro, Hyundai motors, ford India Ltd, Indian army, Huawei, Mahindra Satyam, Accenture, Sundaram fasteners, TCS. Further details regarding job offers, interview dates, selection criteria for the candidates etc. are announced through the training and placement office. Bangalore University or BU is affiliated by University Grants Commission (UGC) and accredited by National Assessment and Accreditation Council (NAAC) with A grade under the new grading system. This university is also a part of Association of Indian Universities (AIU) and Association of Commonwealth Universities (ACU). The distance education courses are approved by Distance Education Bureau (DEB). QS University Ranking: BRICS-2018, an international agency ranked Bangalore University at 245thposition amongst BRICS nations. Hansa Research Survey 2016 published in THE WEEK-May 29, 2016 issue, ranked the Bangalore University at No. 15 in the Top Multi-Disciplinary Universities at All India level, at No.9 in the Top State Multi-Disciplinary Universities, No.5 in the South Zone and No.1 in the State of Karnataka. There are 3 MBA courses mentioned in the prospectus of admission 2017-2018 as PG. Diploma Courses i.e. Eligibility: The candidate must be a graduate from Bangalore University or any other recognised university with a minimum of 40% marks cumulative of languages. Phone: 080-22961261, 22961262, 22961262, 22961263, 22961264, 22961265, 22961266, 22961267.